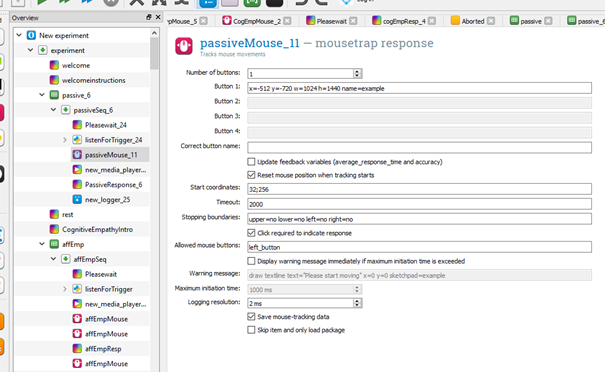 We are having problems with the mousetrap plugin on Openseseme. For some blocks it is working, and other blocks it is not, but the code is still the same. So, on the blocks where it doesn't work, in the response output the co-ordinates are just not being recorded. Instead, the start co-ordinates are the only ones appearing in the document, instead of those clicked during the experiment. 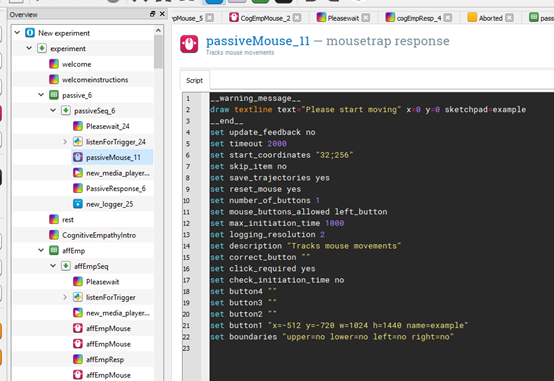 Also, is there any way that Mousetrap can just record the end co-ordinate, rather than the whole tracking sequence? that sounds weird indeed. Maybe just a remark from what I inferred from the screenshots you provided: you have set the logging resolution to an extremely small value (2 ms). I think this is unlikely to cause the problem but I would still suggest to increase it to a value around 10 ms.